Wow! That suggests major implications for the Man of Steel. During the “Trinity War” panel at the San Diego Comic-Con this past weekend, the panelists were asked if Firestorm would be making an appearance. Jeff Lemire responded by saying, “Yeah, Firestorm has a pretty big role in Trinity War, because he can make Kryptonite. He’ll be around.” I guess that answers Amanda Waller’s question! This also helps explain the Firestorm Tarot card labeled, “The Prison” from Part 1 of the “Trinity War”. The pages above comes from the Super Powers Collection mini-comics (1985). Click here for more details on those super-fun comics! Also of interest is the variant cover below to Justice League of America #6 by Brett Booth, Norm Rapmund, and Andrew Dalhouse. It’s a nice cover that features Firestorm prominently! Click the image to enlarge. Remember, check your local comic book shop today for “Trinity War” Part 3 in Justice League Dark #22! 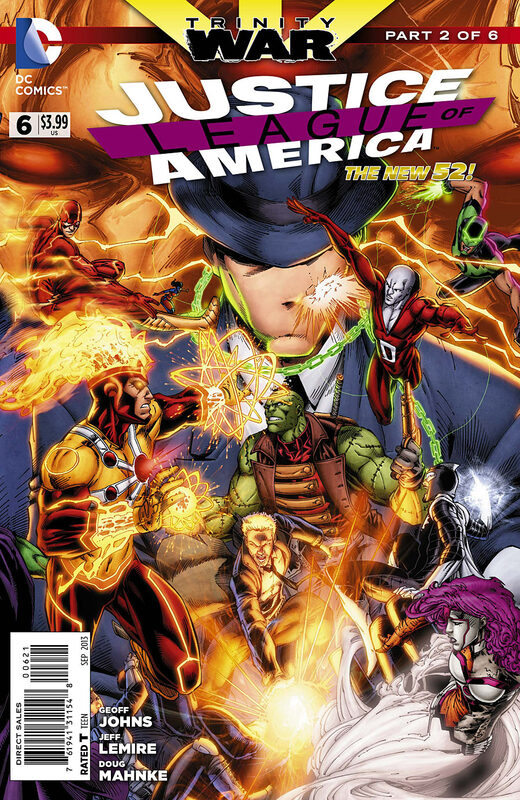 Posted in: Comic books, Firestorm #10: New 52 v2 (Ronnie/Jason), Justice League of America, Super Powers Collection. ← Deathstorm Coming to the New 52? Well, he certainly could in the old DCU, on several occasions…. But could the pre-crisis Firestorm make variety Kryptonite? Gold, X-, White? And would each chunk of Red he made have the same effect, or a different one each time? 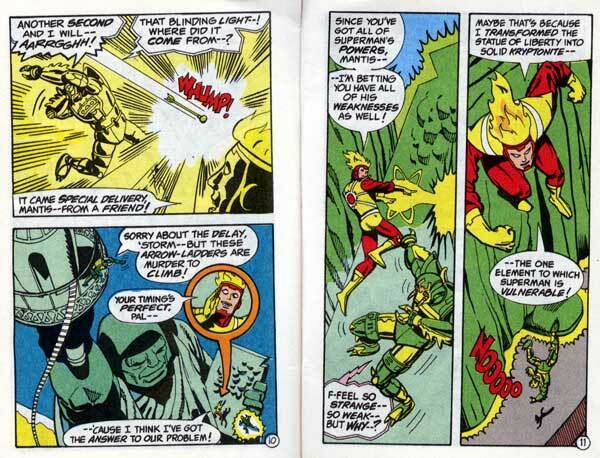 Of course, even if old-school Firestorm could make Kryptonite, that itself proved nothing about what modern Firestorm could do. 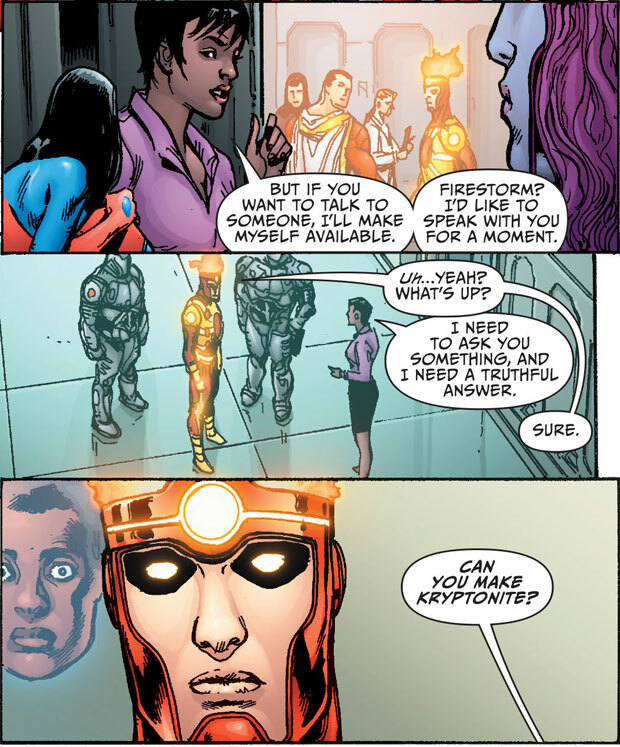 Besides all the changes New 52 has wrought, it was established back when Ronnie was Firestorm on his own that he could no longer make materials he didn’t understand the basic atomic structure of. Not to say that I mind seeing the classic Super Powers comic referenced. Just that it’s kind of irrelevant to New-Waller’s question. True that the picture I referenced was Pre-New 52, but I think Jeff Lemire’s comment referenced above answers the New 52 question.